The 4th International Consensus Conference on Concussion in Sport is one of CJSM’s published pieces that gets referenced frequently. 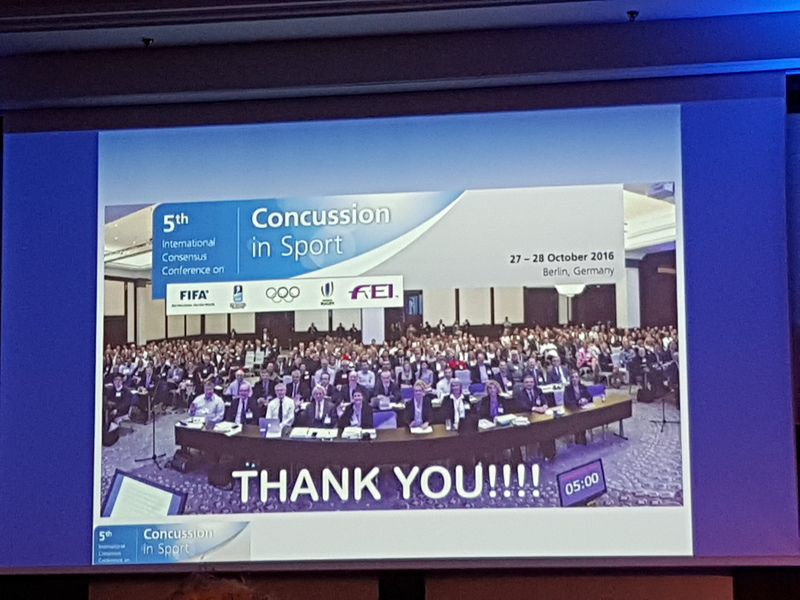 Reflecting work that took place at a conference in Zurich in 2012, it was time to have an update on the issue of sports-related concussions. As many of you know, the 5th consensus conference just took place in Berlin. I was sorry I could not attend, and I look forward to the publications that will emerge from this meeting. Today’s blog post is both about the Berlin conference and the power of social media. I have written about social media and its import in the world of contemporary sports medicine. I have celebrated the ability of media such as Twitter to bring people from different parts of the globe together, essentially obliterating barriers of distance and time. I have lectured frequently on the ability of social media to translate findings from research into clinical practice. Today’s blog post is proof of that power. Some day, I look forward to meeting Osman in person. In the mean time, I hit him up to share with the CJSM readership his impressions from the consensus conference. Thanks so much for taking the time, Osman. 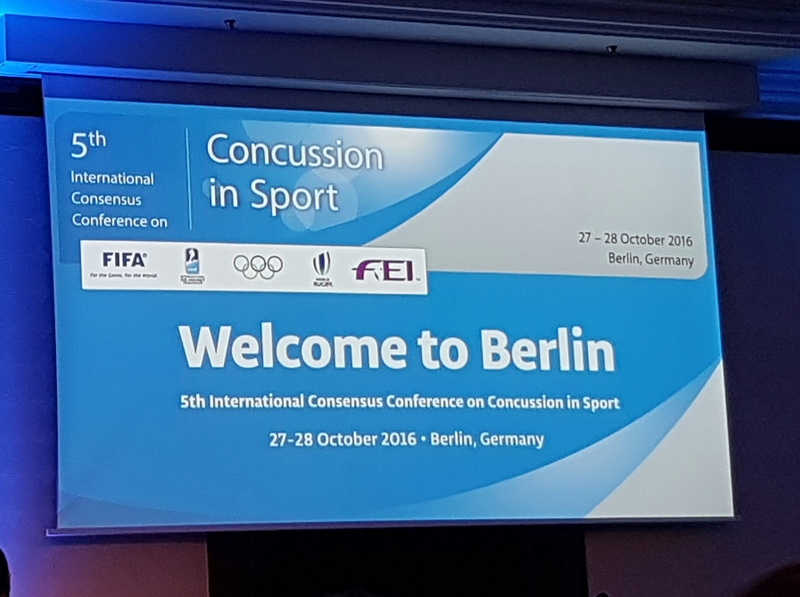 Few in the sports medicine community would argue that a consensus meeting has been as eagerly anticipated as the 5th International Consensus Conference on Concussion in Sport in Berlin this October. Since the last consensus meeting in Zurich in 2012, there has been an ever-increasing focus on sports concussion in the mainstream press , the scientific literature , and also in popular culture . 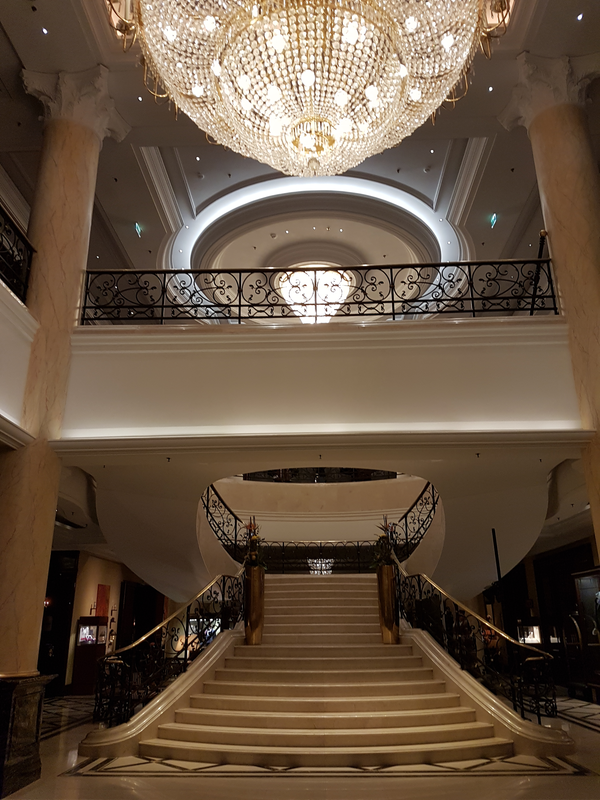 Given the magnitude of this conference, the impressive Ritz-Carlton Hotel in Potzdamer Platz was a fitting setting. The consensus statement then gets widely disseminated in early/mid 2017. I have to give credit to the immense work undertaken by each of the groups on their assigned research questions, and distilling almost 60,000 research papers retrieved by the search strategies into the final ones in each systematic review is an incredible achievement. One of the implications of this format is that the presentations from each group were very much preliminary, as they had yet to have input from the conference attendees or be confirmed by the consensus group following the conference. As such, the organisers made the request that social media dissemination from the conference be limited at this stage to avoid any potential confusion from concepts that were yet to be finalised. Rumours of conspiracy theories flying around online as to “media blackouts” and “shackling” of conference attendees were very much wide of the mark! In keeping with this request, I’m unable to go into depth as to the specific content in each session and the final consensus will be shared widely in 2017 once agreed upon. An indicator of how the concussion in sport consensus conferences have grown is that the last concussion consensus conference in Zurich in 2012 had 50 posters being presented- and this time round there were 200+ posters! The breakout sessions gave everyone the chance to grab a coffee (or a cucumber juice- nicer than it sounds believe me) and check out some of the fantastic research being undertaken worldwide. I was presenting a poster from the work of my collaborators (Richard Weiler, Evert Verhagen, Colin Fuller, and Willem van Mechelen) on disability football and concussion , and it was great to hear Dr James Kissick address the conference and share the desire that disabled athletes do not get left behind in the concussion discussion. One of the best things for me was having the chance to meet up with researchers who I already knew/meet those who I had come across online/meet completely new people. It seemed like practically every presenter or conference attendee who contributed to the discussion was Canadian, and this is a credit to the input and endeavour put into concussion-related research in Canada. The high-quality studies being shared from Canada really was impressive, and as an Englishman who has studied for many years in New Zealand I hope that both of “my countries” can catch up. The point was rightly made in the closing comments that key geographical regions (e.g. Africa, South America, Asia) are not currently part of the concussion conversation and hopefully the next consensus conference will have input from our colleagues in these areas. The measure of a conference is often how early people disappear on the final day (and in some cases before! ), and the fact that practically everyone stayed until the last session of the last day is testament to the speakers present and the enthusiasm of the attendees to learn as much as possible from the experts and each other. The next stage from here will be to await the publications of the findings of this conference, but in the meantime efforts to improve the knowledge base in the area go on. The 2016 consensus statement (due to be available online in Spring 2017) is likely to have an even wider readership than previous consensus and summary/agreement statements , and the hope for all of us in the sports med community is that this will translate into safer sports participation for those athletes under our care. Ahmed OH, Hall E. “It was only a mild concussion”: Exploring the description of sports concussion in online news articles. Phys Ther Sport 2016:15(23);7-13. Kroshus E, Baugh CM, Daneshvar DH. Content, Delivery, and Effectiveness of Concussion Education for US College Coaches. CJSM (2016);26(5):391-397. 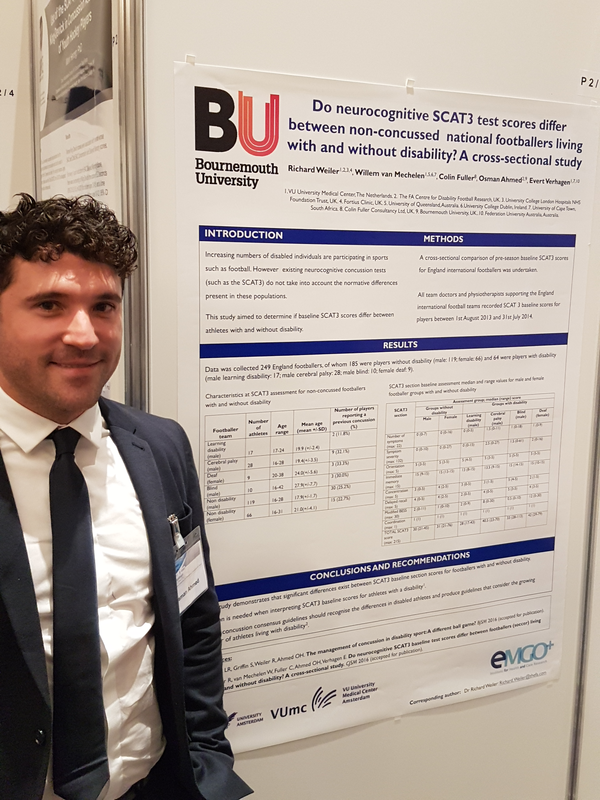 Weiler R, van Mechelen W, Fuller C, Ahmed OH, Verhagen E. Do neurocognitive SCAT3 baseline test scores differ between footballers (soccer) living with and without disability? A cross-sectional study. CJSM 2016 (accepted for publication). Alla S, Sullivan SJ, McCrory P, Hale L (2011). Spreading the word on sports concussion: citation analysis of summary and agreement, position and consensus statements on sports concussion. BJSM 2011;45:132-135. I work at Nationwide Children's Hospital in Columbus, Ohio USA, where I am a specialist in pediatric sports medicine. My academic appointment as an Associate Professor of Pediatrics is through Ohio State University. I am a public health advocate for kids' health and safety. I am also the Deputy Editor for the Clinical Journal of Sport Medicine. I was in Berlin for the Orthopedic Congress. Assuming many of your readers care for athletes like yourself, you may want to obtain Dr Best presentation on ankle issues in soccer. His understanding of how to reduce risk of lateral ligament injuries is on point. We hope to be doing an ankle study with him as soon as. We are also in the later stages of discussion (on a study) with Dai at the Micheli Injury Prevention Center. This study will incorporate our ACL tube into their post reconstruction protocol. I know Tom Best and Dai Sugimoto both, that is great that you are working with them. Good luck with those collaborations. "The CJSM blog offers the opportunity for clinicians with a primary interest in sports medicine practice to discuss current issues in the world of sport and exercise medicine. The blog acts as a community platform for knowledge sharing; its goals are the promotion and dissemination of best clinical practices for our patients." Local anesthetic use in sport for early return to play - should we be offering these jabs?